Eugene Melnyk’s Leigh Court made every pole a winning one to capture Saturday’s $150,700 Grade 3 Ontario Colleen Stakes, at Woodbine. Trained by Josie Carroll, the dark bay daughter of Grand Slam-Padmore came into the one-mile turf stake off an impressive 5 1/2-length score in the main track Duchess Stakes. Leigh Court, a half-sister to Barracks Road, a multiple stakes winner on the Woodbine lawn, made her turf debut in the Ontario Colleen a memorable one under Gary Boulanger setting splits of :23.75 and :46.70 keeping plenty in reserve to leg out a 3/4-length win. Overheard closed to be second, 2 1/4-lengths in front of Coffee Clique. Leigh Court covered the mile in 1:33.32. Boulanger, who breezed Leigh Court four furlongs in :49.20 over the Woodbine training turf in advance of the Ontario Colleen, expected a good effort from his filly. The speedy bay has relaxed considerably since Boulanger climbed aboard two starts back. In the Duchess score, Boulanger coaxed a moderate pace out of the filly and had plenty of horse for the stretch run. 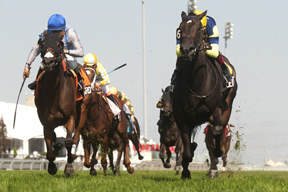 The journeyman expected more of the same in the Ontario Colleen. “I thought I’d be one the lead for sure, it was just a matter of how aggressive she was,” said Boulanger. Carroll pointed to her staff as the main reason that Leigh Court has grown into a stakes winner. Carroll also extended her appreciation to Boulanger for engineering a winnable trip on a new surface. Leigh Court banked $90,000 in victory, while improving her record to 4-2-0 from seven career starts. She returned $12, $6.10 and $3.20, pairing with Overheard ($4.50, $2.60) for a $51.10 (6-7) exactor. A 6-7-4 (Coffee Clique, $2.10 to show) triactor was worth $122.30. Sky Treasure completed a $1 Superfecta (6-7-4-8) worth $214.25.